is ideal where there is no readily available piped water. Envirogard Hire supply this machine with double the normal length of jetwash hose - 30m of high pressure hose; this allows you to refresh the areas that other jetwash machines simply cannot reach ! 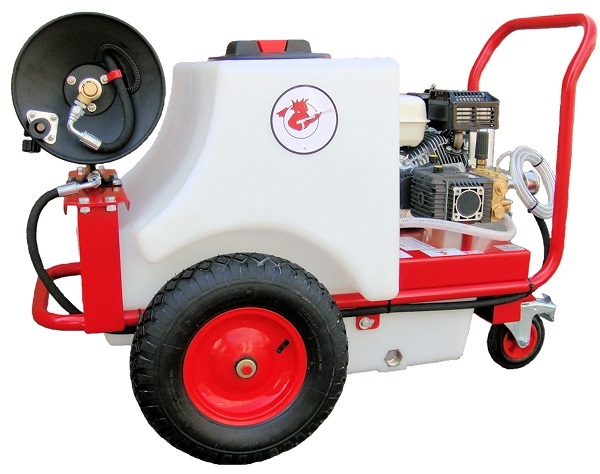 The Tornado P2 produces 2200psi / 150 bar pressure; combined with 13 liter / minute water throughput this makes it a very effective cleaning machine. Additionaly it has the facility to add detergent / cleaning agent in-line. The Tornado utilises water from the integral tank which can simply be filled through the tank lid; alternatively if piped water is available a hose can be connected to an auto-refill point on the tank. The machine is easily manoeuvred on its pneumatic tyres and - at just 660mm wide - is compact enough to pass through standard doors, be wheeled through buildings, carried in a vehicle, stored in a site security container. Dimensions: L 1170mm x W 660mm x H870mm, weight empty 78 kg, with full water tank 228 kg, Fuel tank capacity 3 litres petrol. Click here for a Data Sheet on the Tornado P2 Bowser Jetwash. If the Tornado pressure washer doesn't suit your requirement then perhaps the full size Commando 4000 highway-towable pressure washer will. 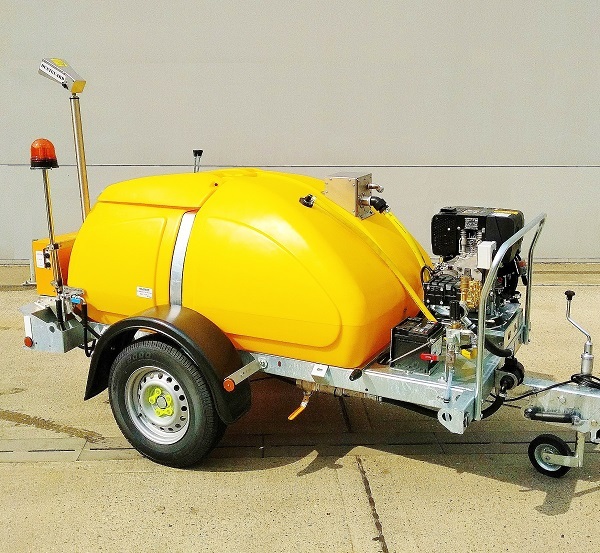 Powered by an electric start Hatz diesel engine, with a 1000+ litre water tank, and 30 metres of high pressure hose mounted on a reel - the Commando delivers 2900 psi / 200 bar high pressure water at 18 litres per minute. It is suitable for highway tow, is equipped with a 50mm ball coupling, road lights & over-run braking system, with a maximum authorised mass of 1500 kg. As an additional feature the Commando 4000 can be equipped with a Dustguard aerial misting unit which will throw a fine spray of water up to 25 metres for suppression of fugitive dusts. The spray head of the Dustguard can be set to automatically sweep from side to side, covering large areas with a fine water mist. Trailer dimensions are L 3475 x W 1550 x H 2000 mm (with Dustguard), fuel tank capacity 5 litres diesel. Click here for a Data Sheet on the Commando 4000.